Opened on April 6th 1970 the Queensgate Market Hall was built with a bespoke roof system of 21 asymmetric curved shells. 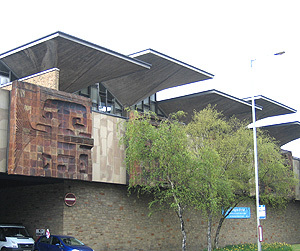 The design allows for maximum light into the market and is considered to be the best example still standing of a retail market from the 1960s and 1970s. The exterior of the building incorporates natural stone with exposed concrete and several art relief panels all individually sculpted by the artist Fritz Steller. The Hall has been haled by local architecture expert Adrian Evans as "A spectacular combination of architecture, engineering and art."